"An aged king decides to divide his kingdom between his three daughters, according to which of them is most eloquent in praising him. His favourite, Cordelia, says nothing. 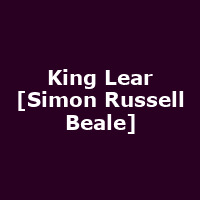 Simon Russell Beale, whose recent appearances at the National include Timon of Athens and Collaborators, takes the title role in Shakespeare's tragedy."